The Ten x Ten 2013 release party and exhibition was a great success on November 16th. Thank you to everyone who came out to enjoy the print exhibition and world premiere live performance of the ten new compositions written for the project. If you'd like to purchase the suite of ten prints and vinyl record, please visit Spudnik Press. Saki Records will host a listening party on January 4th at 6pm for those who missed the festivities this past weekend. Heatspell is an interactive animation project from Ten x Ten 2013 participant Jo Dery and Ten x Ten 2012 participant Nate Beaty. Combining illustration, graphic novel storytelling and music, Heatspell tells the story of ten neighbors suffering through a Chicago heatwave. We could easily spend an entire afternoon navigating this incredible site! Tagged with ten x ten. November 25, 2013 by Billie Howard. Access Contemporary Music’s Artistic Director and Conductor, Francesco Milioto talks with Homeroom about musical side of the collaborative Ten x Ten project. Milioto will conduct the Palomar Ensemble at the Ten x Ten Release Concert & Exhibition this Saturday, November 16th at 6:00pm at the Ukrainian Institute of Modern Art. Homeroom: The Ten x Ten project is unique in that visual artists and composers collaborate from the first stages of the creative project instead of in response to each other's work. As the conductor of the musical portion of the project, did you notice anything different about the pieces as opposed to other musical works because of this collaboration? I don't think there is necessarily something "different" about these compositions, but simply something abstractly specific! It's hard enough to describe a painting with words, imagine with music! In a way the music ends up being an imitation, or something that parallels the work in a way. That is what I find interesting about each of these pieces, the way the composer is trying to connect to each painting, and what they are trying to say about it. HR: The composers used a unique combination of instruments for this project. Can you describe how each instrument might be reflected in the corresponding visual prints? FM: I think each composer found a way to use not only each instruments qualities, but all the possible combinations of instruments to suite the idea. As musician will use their imagination and I am sure when asked, a lot of the thoughts would overlap! HR: Take us back to the recording process. How is it different to rehearse an ensemble for a recording session rather than a live performance? FM: Recording is always different. We can record in shorter chunks of music, though I do like to have takes of the whole piece as well. For either live performances or recordings the goal is to have an arch all the way through... which in recording is difficult, especially when you stop and start! Tempi, tuning, continuity.. etc.. are all much harder to keep consistent in a recording studio. HR: What are you most looking forward to at the Ten x Ten Release Concert & Exhibition? FM: I am most looking forward to the audience reaction and comments on experiencing both the visuals and music at the same time! HR: Which music would you like to have performed at your funeral? FM: Intermezzo from Cavalleria Rusticana. Tagged with interview, music, classical, ten x ten. November 12, 2013 by Billie Howard. The Ukrainian Institute of Modern Art (UIMA) plays host to the Ten x Ten release concert & exhibition this November. 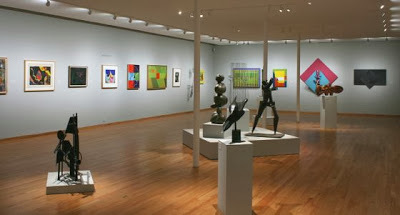 Located in the heart of Chicago’s Ukrainian Village, the Institute boasts 2100 square feet of modern gallery space. UIMA is proud to offer not only a regular schedule of fine art exhibits, but also musical and literary events, films, gallery talks and other special events. Currently on view is a selection of works from UIMA’s permanent collection focusing on artwork that was created in Chicago. In the surrounding “Ukie” neighborhood, it’s easy to bump into both young couples as well as 70 year old Ukrainian ladies out picking up perennials for their gardens at Sprout Home, dining on Middle Eastern food at Chickpea or stocking up on rye bread and Eastern European treats at Ann’s Bakery and Deli. The neighborhood has been a hub for Ukrainians since the beginning of the 20th century and currently is home to several Ukrainian churches, banks, a grammar school and other cultural institutions. Eclectic shopping options geared toward the young professional crowd have popped up in the last decade, including the colorful and well-stocked Very Best Vintage, comic book and graphic novel superstore Vigilante Press, modern and vintage eyewear heaven Labrabbit Optics and one of the best places to stock up vinyl and local music in the city: Permanent Records. The Ukrainian Village also offers great dining options, from classic Italian at A Tavola or pub fare taken up a notch at Old Oak Tap to innovative sushi at Arami. If you’re looking for something sweet, try West Town Bakery for vegan options or Hoosier Mama Pie company for some of the best pies you’ll ever taste. We look forward to enjoying this vibrant neighborhood on November 16th, when Ten x Ten is celebrated with a Release Exhibition & Concert at the Ukrainian Institute of Modern Art. Tickets are available here. Photo courtesy Ukrainian Institute of Modern Art. Tagged with ten x ten, 10 x 10. October 19, 2013 by Tse Townsend.